SharePad is designed to work on both tablets and computers because of this there are two ways to open the search dialog window. On a computer you can just start typing on your keyboard. The moment you press a letter or number key the Find a share window will open. In this example I pressed the 'a' key on my keyboard while viewing the FTSE 350 list. 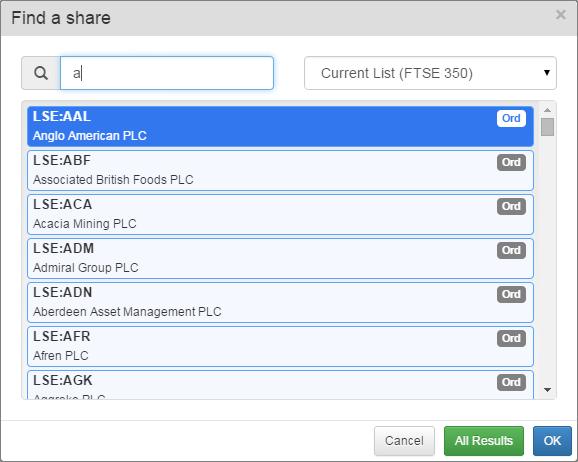 The Find a share window has opened and is showing me a list of shares which have 'a' in their name. The other way to open the Find a share dialog window is to click on the orange Search button on the main toolbar. 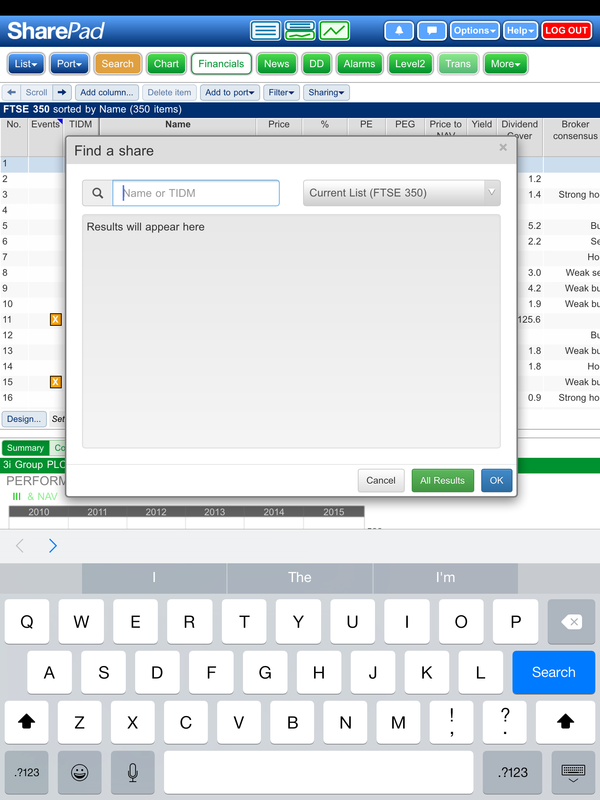 Click on this button on a tablet opens the Find a share dialog and it also opens the tablet's keyboard as well. From there you can start typing and SharePad will dynamically update the list of results as you do. SharePad allows you to search for an instrument by name or for part of that name. In this example we have started search the FTSE 350 list and typed in cent. SharePad is showing us a list of 3 matches. Centamin and Centrica both start with our search term. Computacenter, however, has the search term as part of its name. So you can see that SharePad will search for the term anywhere within the name of the instrument. SharePad can also search for a company by TIDM or EPIC. 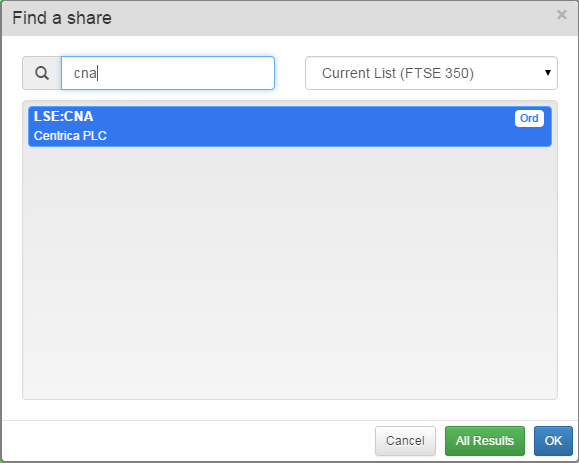 In this example we have entered cna which is the EPIC code for Centrica PLC. There are two more unique identifiers that shares and other types on instruments have these are called the SEDOL (Stock Exchange Daily Official List) and the ISIN (International Securities Identification Number). The SEDOL is a unique identification code, made up of 7 alphanumeric characters, that is assigned to all securities trading on the London Stock Exchange and on other smaller exchanges in the United Kingdom. The ISIN is a unique identification code defined by ISO 6166. It is made up of 12 alphanumeric characters. An ISIN consists of three parts: Generally, a two letter country code, a nine character alpha-numeric national security identifier (in the case of LSE stocks this is the SEDOL), and a single check digit. Here you can see we have added both the SEDOL and the ISIN as columns in a table in SharePad. You can see, for example, that Centrica's SEDOL forms part of its ISIN: GB00B033F229. In SharePad you can search for both of these codes. Here you can see I have searched for Centrica by its ISIN and then its SEDOL. Searching on ISIN or SEDOL for Shares is not usually necessary as you will nearly always know the name or the TIDM/EPIC code for the share. However, when searching for Unit Trusts, which can have very long and often abbreviated names, they can help to ensure the instrument you have found in SharePad is the instrument you are looking for. One of the unique features of SharePad's search function is the ability to turn your search results into a temporary list. 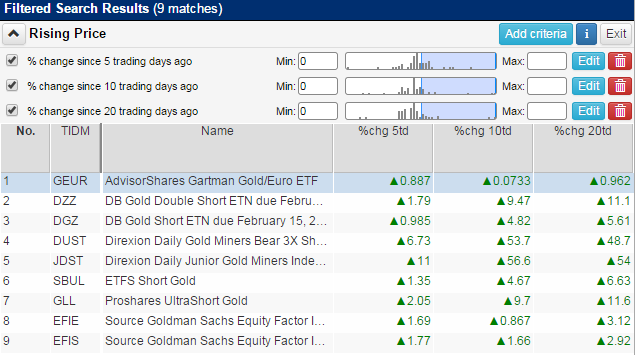 In this example we have select the Exchange Traded Fund list and then searched the list for gold. 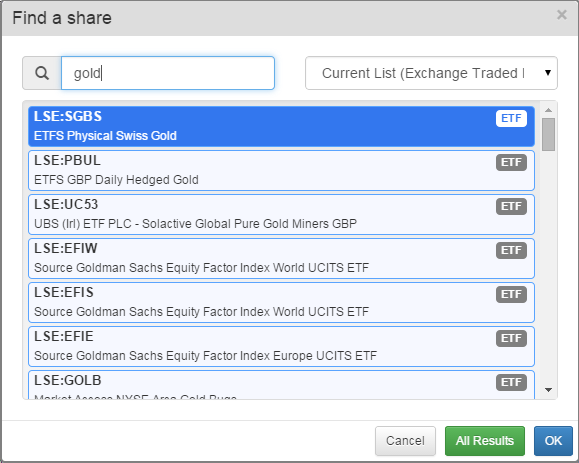 Instead of selecting an individual ETF in the list and clicking on instead we can click on the button. This will then generate a list containing the results of our search. It is then possible to apply a filter to this list using the filtering functionality of SharePad to create an even shorter list of results. 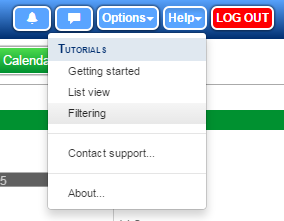 For more information about filtering either select Help and then Filtering under the Tutorials heading from within SharePad or click here for a tutorial.